This week, we have a look at P&O’s new flagship, which is to be introduced four years from now, and their plans to choose a name for her by running a contest. Elswhere, Cruceros Australis have chosen the name Ventus Australis for their own new 210-berth flagship. And we travel fifty years back in time, to 1966, to have a look at the Kungsholm and the Eugenio C, two of the finest ships produced in the era just before the cruise ship boom of the early 1970s. In London last week P&O Cruises announced a few details for its 180,000-ton cruise ship newbuilding, due for delivery in the summer of 2020. The LNG-fuelled vessel, like other being built for AIDA, Costa and Carnival Cruise Line, will be based on an enlarged version of the AIDAprima design but adapted to the UK market. A major new entertainment hub called The Dome will be among the star attractions of the new ship, the company said. Featuring a clear sky dome, a pool with a retractable stage, water feature and whirlpools, The Dome will act as an all-weather venue for all day entertainment and informal dining. At night The Dome, one of four primary entertainment spaces on the new ship, will feature aerial performances, projection onto the roof and shows. There will also be an uninterrupted half-mile Promenade around the ship on Deck 8, which will provides access to a number of al fresco dining venues. Glass walls spanning three decks will allow natural light into P&O Cruises signature Atrium, at the centre of the 5,200-passenger ship, complete with a grand staircase, gallery and overhead walkways. The new ship will feature seventeen places to eat and twelve places to enjoy a drink and see the sea as well as thirteen entertainment venues. The ship will also feature four swimming pools, one of which will be indoors, and sixteen whirlpools. When it comes to picking a name, however, P&O said it would be doing this by contest. One hopes that this will be a better arrangement than that used recently by the UK Government to choose a name for the new flagship of its British Antarctic Survey. The name chosen by the public was Boaty McBoatface. Instead, the 410-foot research ship has been named Sir David Attenborough and one of her underwater vehicles will now carry the name Boaty McBoatface. Sales for the new P&O flagship will open in late 2018. Ventus Australis is the name announced for the new 210-berth cruise ship being built for Cruceros Australis, who now operate the 200-berth Stella Australis in the Chilean Fjords. The new ship will enter service in October 2017. The name – Latin for “Southern Wind” – reflects Tierra del Fuego’s distinctive weather, a factor that so impressed the early mariners who endeavored to explore Patagonia’s southernmost waterways. Two previous Cruceros Australis ships have gone to Galapagos operators recently, with the 184-berth Via Australis having been acquired by Lindblad Expeditions and renamed her Endeavour II earlier this year. Last year that vessel was preceded to the Galapgaos by the 120-berth Mare Australis, which was sold and became Metropolitan Touring’s Santa Cruz II. Two of the last classic ocean liners appeared in 1966, on the tail of Home Lines’ 39,241-ton 1,138-berth Oceanic of 1965, which although designed for the Southampton-Montreal run was placed directly into service as a cruise ship when she was delivered. The first of the 1966-built ships, the 26,678-ton 713-berth Kungsholm, was probably the most beautiful ocean liner ever built. Completed by John Brown & Co Ltd at Clydebank, she was delivered to the Swedish American Line in 1966. The next major liner to be built in this shipyard would be Cunard Line’s Queen Elizabeth 2. 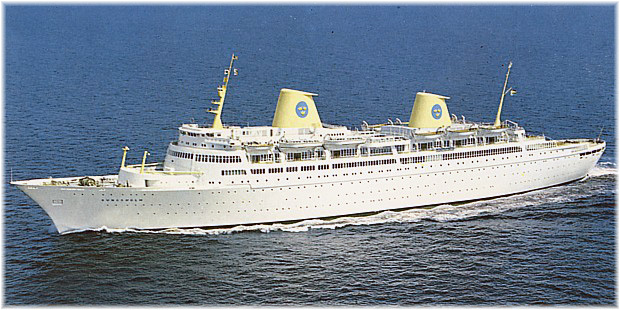 In 1978, she was sold to P&O Cruises, who operated her until 2002, first as the Sea Princess and later as Victoria. 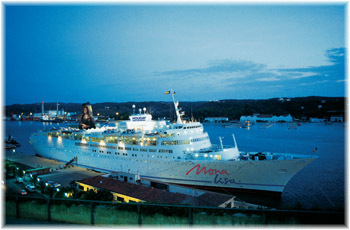 She then operated for various owners as the Oceanic II and Mona Lisa. In 1999/2000, she circumnavigated Africa for a revival of the Union-Castle Royal Mail and in 2008/2009 she worked for the Japanese organisation PeaceBoat. 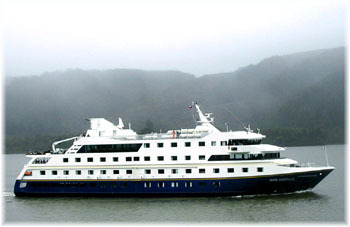 In early 2010 she was based at the Port of Squamish, outside of Vancouver, where she was used as an accommodation ship for the Winter Olympics and Paralympics. She then served as the hotel ship Veronica in Oman from 2010 until 2013 before being laid up and finally broken up at Alang in November 2015. Also completed in 1966, the 32,753-ton 1,636-berth Eugenio C was built for the Europe-South America service of the Costa Line. Eugenio C was delivered to Costa on August 22, 1966, and set out on her maiden Transatlantic voyage to South America on the same day. 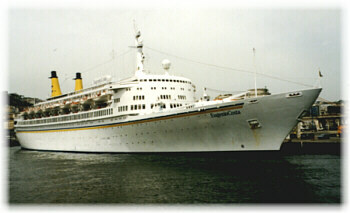 In 1984, she was extensively renovated and renamed Eugenio Costa. As Eugenio Costa, the ship served what became Costa Cruises for twelve years before completing her last cruise for her original owners in November 1996. Costa then sold the ship to the Bremer Vulkan shipyard in part exchange for the construction of the Costa Victoria. Lowline Shipping then acquired her for charter to UK-based Direct Cruises, a line that offered direct sell budget cruises. For this she was renamed Edinburgh Castle. Mechanical problems brought about great difficulty to Direct and Lowline, until Direct filed for liquidation and Lowline Shipping for bankruptcy in 1999. Ownership of Edinburgh Castle passed to Lowline’s main creditor, shipbuilders Cammell Laird of Birkrnhrad. Cammell Laird chartered the vessel to Premier Cruises, who renamed her Big Red Boat II. Premier went into liquidation in September 2000, and she was laid up at Freeport. Big Red Boat II was sold to Argo Ship Management in 2003, who allowed her condition to deteriorate. But being a steam-powered ship she languished at Freeport for five long years. Not being able to find a buyer for use as either a cruise ship or a hotel, she was sold to Indian shipbreakers and delivered to the breakers’ yard at Alang in 2005.